Scampi, located on 18th Street between Fifth and Sixth Avenues, is a Southern Italian restaurant with an emphasis on seafood. Just slightly south of Flatiron District boundaries, Scampi recently became a "Friend of the Flatiron," investing in the neighborhood as a member of the BID's marketing affiliate program. "The Flatiron District is the heart of Manhattan. Everything is right here. I like the proximity to the Union Square Market - we retrieve a lot of fresh produce from those guys. The convenience of being close to all train lines is important to me - we wanted to make sure that everyone can reach us easily," says Chef and Owner, PJ Calapa, the mastermind behind Scampi. "The balance of residential and corporate is pretty outstanding and rare for a Manhattan neighborhood. We wanted to work with Flatiron/23rd Street Partnership because they know how to take care of this neighborhood. This district sees a lot of foot traffic but they still manage to keep the streets clean and litter-resistant. The efforts that they go to to care for this district is truly admirable which is why we wanted to incorporate them in the Scampi Family." Although the restaurant boasts both a great location and charming, warm atmosphere, after a meal at Scampi it becomes clear that the singular focus is the food. One bite of their Mafaldini "Scampi" Pasta (pictured above) and you understand how this dish became the restaurant's namesake. Long ribbons of Mafaldini are coated in a rich butter sauce and combined with gulf shrimp, parsley, garlic, lemon and bread crumbs. The end result is craveworthy. The Rib Eye Steak is another dish you'll be thinking about weeks after your meal. 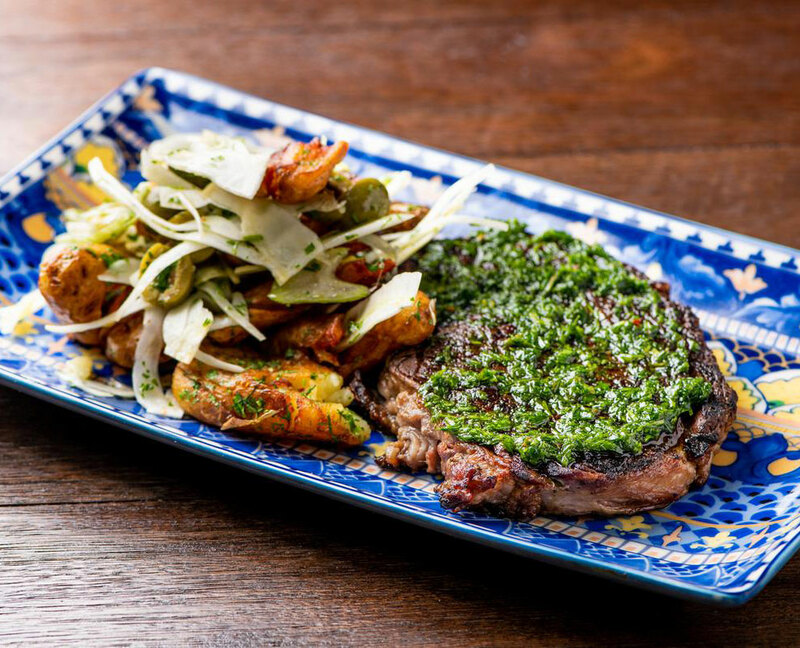 Topped with salsa verde, fennel, olives, the steak is served with crispy fingerling potatoes. 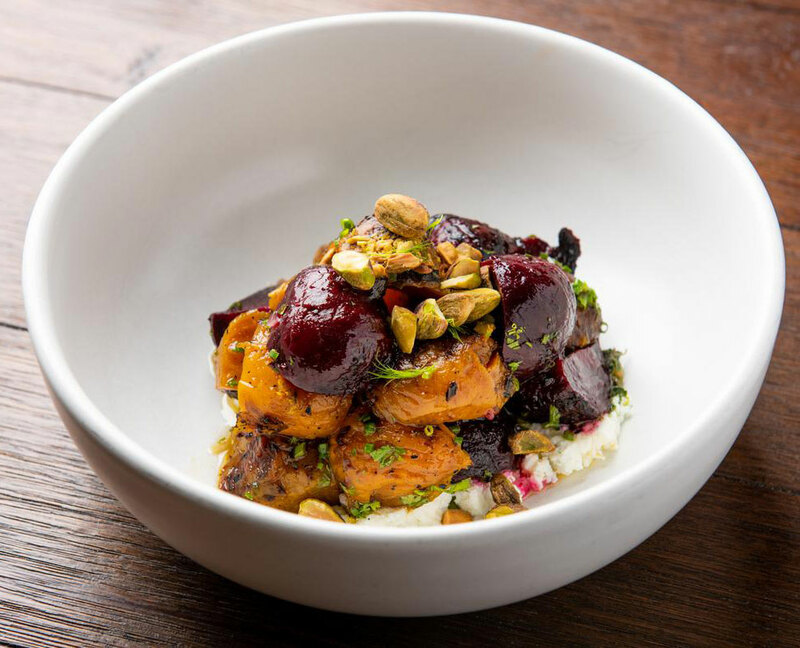 This neighborhood gem serves lunch and dinner daily, and the new weekend brunch offering is sure to become a neighborhood favorite. In addition to the main dining room, they also have a private room which can accommodate up to 60 people. Scampi is perfect for an intimate dinner, an "in-and-out" business lunch, or even a quick drink at the bustling cocktail bar. Scampi is open weekdays for lunch from 11:30 am - 2:30 pm, and serves weekend brunch from 11 am -2:30 pm. Dinner starts at 5 pm each evening and ends at 9 pm Sunday through Wednesday. On Friday and Saturday, dinner service continues until 11 pm.